Even before learning the language, an expat must contend with the proper nouns of life in a new country. City names. Street names. Metro stop names. Pronunciation, particularly in places which use grander alphabets than we're used to, can be a problem. Skøyenåsen, anyone? Nuances in accent and emphasis can also cause a problem. In California, I used to love watching non-Californians attempt names like Mission Viejo or Joaquin Murieta or even San Jose. (Which exit takes you to downtown San Joh-zy ?) My own parents admit that, when they relocated to California from Illinois in the early '80s, they mispronounced Tuolumne Meadows for a while... Too-oh-LOOM-nay . The inability to pronounce place names can be disorienting, but because it's a question of survival--you must know how to navigate your way to work, food, community, airport, and entertainment--as an expat, you do it. We did. Thanks to brunt force memorization, words like Stortinget, Jernbanetorget, and Frognerseteren entered our vernacular. 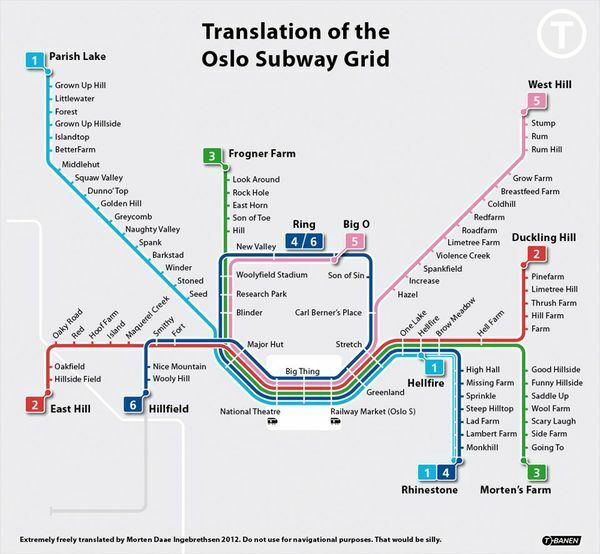 Quickly, we knew where these places were and how to get there via the clean, efficient Oslo Metro. Nailed it. Only later in our immersion did we realize that we were actually visiting Big Thing, Railway Market, and Frogner Farm. 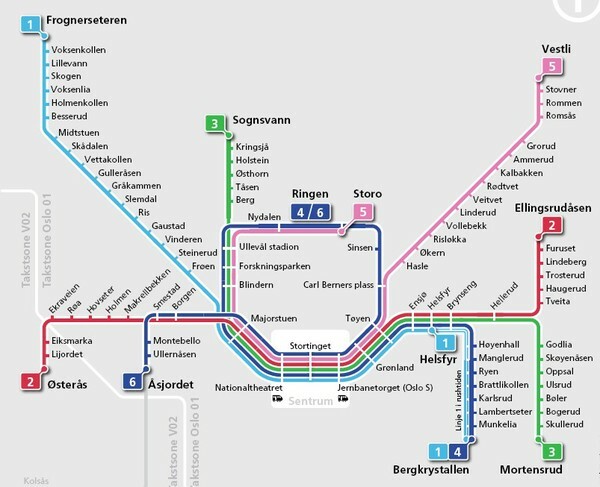 That's why I love this hilarious direct-translation map of the metro. The next time you're in Oslo, make sure you visit some of my favorite places (on this list), including Spankfield, Son of Toe, Stretch, Hellfire, Stump, Breastfeed Farm, Funny Hillside, and Scary Laugh. How many books does one woman need at her bedside?